La Princesse Jaune (literally The Yellow Princess) was the first of Saint-Saëns’ operas to be staged, and despite initially being a flop (it ran for only five performances) it was something of a trailblazer in terms of subject matter. While things Japanese became the rage late in the 19th century, Saint-Saëns’ tale of a young man’s obsession with the picture of a Japanese princess appeared in 1872; some 13 years before The Mikado and 15 years before the appearance of Pierre Loti’s (in)famous novel, Madame Chrysanthème, which formed the basis not only of an opera by Messager but, more importantly, inspired Puccini’s 1904 hit, Madama Butterfly. 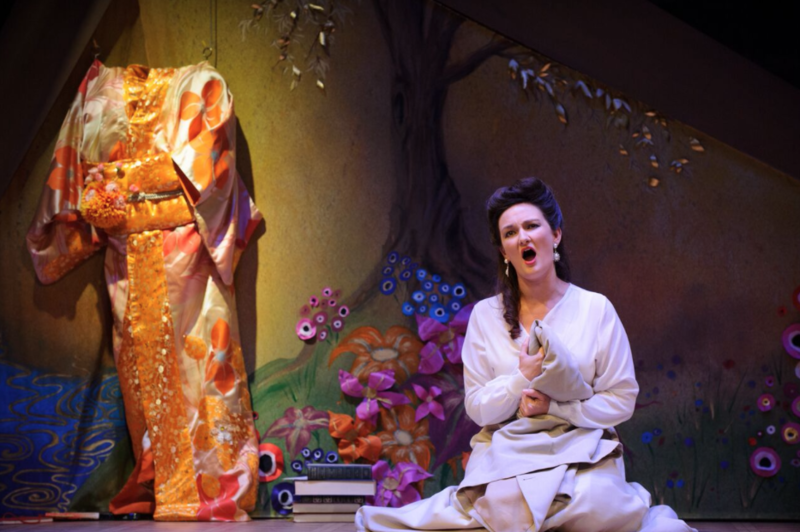 Lyric Opera of Melbourne are to be congratulated for giving the work its Australian premiere season in a simple, thoughtful and elegant production, directed by Miki Oikawa. There is no avoiding the fact that this opéra comique is a product of its time and place. The decision to translate the title as The Japanese Princess could be seen an act of political correctness, but it does accurately convey the geographical nature of the scenario. References to “slanty eyes” and the like have to be taken with a grain of salt and balanced up against the fact that the composer and librettist did actually do some homework in choosing and translating a real Japanese poem as part of the text. Saint-Saëns’ score is also decidedly of its era, the oriental flavour being primarily supplied through the interweaving of pentatonic passages throughout the otherwise lyrical writing. Ably and sensitively conducted by the Lyric’s Artistic Director, Pat Miller, the music has an immediate appeal, and – as befits an opera with only two singers – is lightly scored for strings, a smattering of winds, harp and harmonium. The ensemble cohered together well, especially in a “pit” position and solos (of which there were quite a few) were all ably executed. The story concerns Kornélis, an art student who is besotted with all things Japanese and his cousin and fiancé Léna, who despairs of her love ever being requited. 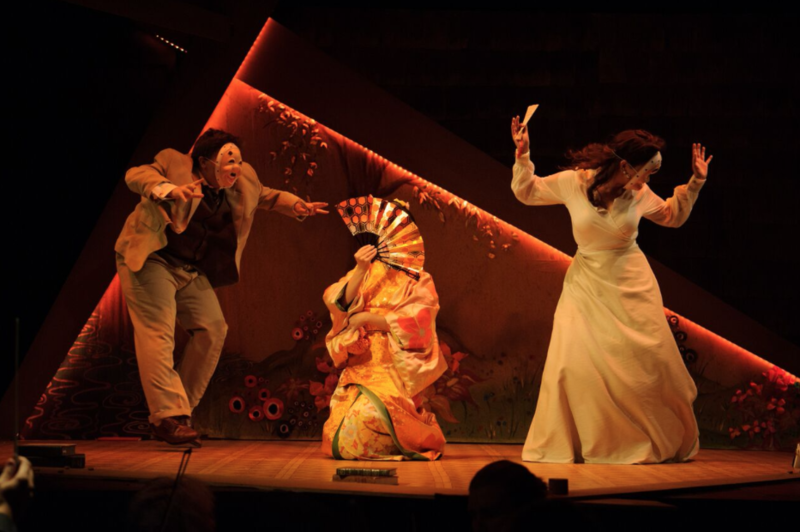 At the heart of the opera Kornélis takes a trip to Japan (courtesy of absinthe in this production, although in other versions he uses opium) only to discover that he is not really in love with his Japanese paramour, Ming, but rather in love with Léna after all. It is no surprise that a happy ending ensues. The evocative set by Christina Logan Bell worked well throughout, providing space for the mute presence of the dancer to observe and comment on proceedings. Costumes by the Lyric’s resident costume designer, Lucy Wilkins were contrasting and appropriate, while Lucy Birkinshaw’s lighting design was effectively unobtrusive. All in all, this was a wonderful hour’s entertainment in which all elements came together to make an enjoyable whole. Like a good many French things it was a little exotic, not too heavy, well done and left you wanting more. So avail yourself of this treat while you can!